We knew Wall Street loved Mitt Romney, but this is ridiculous. One devoted trader apparently lost between $4 million and $7 million in just two weeks last year trying to manipulate the Intrade prediction market to make Romney's election chances look better than they really were, a new study suggests. Here's why you should care, even though Intrade is now defunct: We media types watch prediction markets closely because they are seen as infallible gauges of conventional wisdom. Romney is surging! It says so on Intrade! But if these markets can be manipulated, maybe we should look at them a little more skeptically. "It is worth knowing that a highly visible market that drove many a media narrative could be manipulated at a cost less than that of a primetime television commercial," wrote the study's authors, David Rothschild of Microsoft Research in New York and Rajiv Sethi of Barnard College, Columbia University. Their study crunches all of the action on Intrade in two weeks leading up to the November 2012 election. By volume, Intrade was the biggest market for bets on the election's winner. Still, just one trader -- whose identity is unknown to the researchers or anybody else but Intrade (call us, trader!) -- was responsible for about a third of the trading in Mitt Romney contracts during that period. 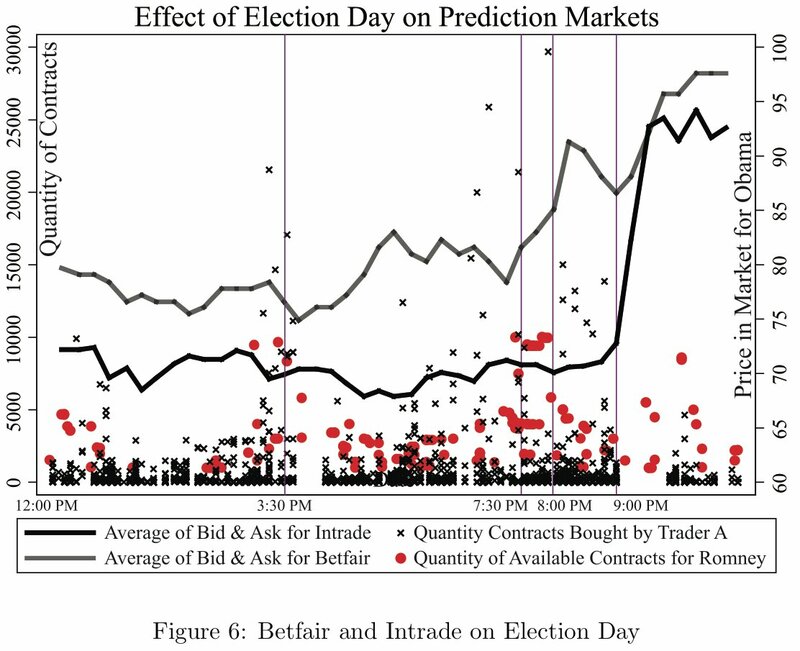 This gap between Intrade and Betfair prices for Romney was wide and persistent for several days ahead of the election, leading to widespread suspicions of market manipulation. It turns out those suspicions were probably right. The trader's motive is still a mystery. It seems unlikely that he or she was trying to make a killing on a Romney upset or hedge some other kind of investment. The trader could simply have been trying to make Romney look stronger to boost donations and voter turnout. In an email to the Huffington Post, Sethi pointed out that the effort at manipulation failed. Romney lost handily, for one thing -- an outcome that Intrade still predicted, despite Trader A's best efforts. Nobody was fooled by Intrade action if they also watched other prediction markets, conventional wisdom and polls. Still, come 2016, it will be worth remembering how easily these markets can be pushed around by somebody with the motivation and cash to burn. 20th-century American poet Allen Ginsberg (1926–1997) is most known for his contributions to the Beat Generation. But before he found success through writing, Ginsberg held a <a href="http://www.rooknet.net/beatpage/writers/ginsberg.html" target="_blank">variety of jobs</a> including a dishwasher, spot welder, night porter, and cargo ship worker. Eventually, Ginsberg quit his day jobs to write full time. His most famous poem is "Howl," which became a bestseller and brought Ginsberg instant fame.